"So far, neither Trump's many easily detectable lies nor his conspicuous behavior seem to have left any impression on voters. … The same type of enraged German citizen who cries 'lying press' - in the U.S. hoots with delight at Trump's political improprieties. After each of Trump's outbursts the mainstream media wonders when, at last, the red line will have been crossed. Now though, a growing number of disillusioned analysts are concluding that in the United States, there may no longer be any red lines." Washington: Whenever Donald Trump feels under pressure, he lashes out - this time against a disabled New York Times journalist who Trump mimicked and mocked on an open stage [video below]. The backdrop are Trump’s disputed remarks about thousands of Muslims in New Jersey who allegedly publicly celebrated after the September 11, 2001 terrorist attacks on New York and the Pentagon. Back then, stories about such alleged celebrations circulated across America, but could never be corroborated. At the time, Serge Kovaleski investigated these accusations for The Washington Post. To substantiate his thesis, Trump cited an article by Kovaleski written a week after the attacks. In it Kovaleski wrote that in Jersey City, an Arab stronghold near New York, "Law enforcement authorities detained and questioned a number of people who were allegedly seen celebrating the attacks and holding tailgate-style parties on rooftops while they watched the devastation on the other side of the river." On CNN this week, the journalist recalled that he doesn't remember "anyone saying there were thousands, or even hundreds, of people celebrating," as Trump alleged. This contradiction has earned him the wrath of the real estate mogul and Republican presidential candidate. At an election rally in South Carolina on Tuesday, Trump sought to ridicule the journalist. "Now this poor guy - you ought to see this guy," Trump said, mimicking the gestures of Kovaleski, who suffers from the congenital muscle stiffening disease Arthrogryposis, usual hand movement. "Now the poor guy, you gotta see this guy: 'Uh, I don’t know what I said. I don’t remember.' He’s going, 'I don’t remember. Maybe that’s what I said," all the while mimicking Kovaleski in his appearance on CNN. As the video of Trump's appearance in South Carolina spread, a wave of indignation broke out over the way Trump made use of Kovaleski's disability to mock him and ridicule his statements. For instance, Washington Post columnist Charles Lane took to Twitter on Wednesday evening writing "this is vile." He describes it as "a new low" for Trump and behavior that goes far beyond acceptable behavior from anyone, let alone a presidential candidate. "Donald Trump can always go lower," commented Jeffrey Goldberg of The Atlantic. The New York Times also said in a statement that it is "outrageous that he would ridicule the appearance of one of our reporters." 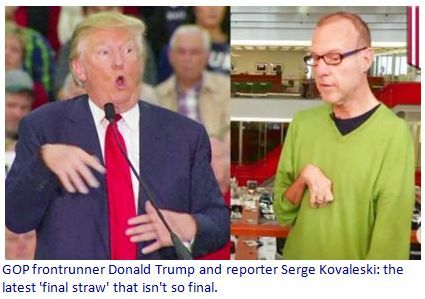 The video of @realDonaldTrump mocking Serge Kovaleski for his physical disability is a new low, even for this candidate. An adviser to the Trump campaign later [watch below] sought to downplay his performance. He "didn't know about Kovaleski's medical condition and was not in any way mocking his physical appearance." Yet Trump knew exactly the kind of disability Kovaleski had. After all, the reporter had covered Trump over a period of six years for The New York Daily News. "The sad part about it is, it didn’t in the slightest bit jar or surprise me that Donald Trump would do something this low-rent, given his track record," Kovaleski told The Washington Post. He is also certain that Trump himself would have remembered him and his disability. This wasn't the first time during this campaign that Trump has made fun of a disabled journalist. In July, for example, he attacked conservative columnist Charles Krauthammer for sharply criticizing him and describing him as a "rodeo clown." Trump then said in response, "I'm being insulted by a guy who can't even buy a pair of pants –he's calling me names?" [translated quote]. Krauthammer is paralyzed from the waist down and is confined to a wheelchair. Trump has made sport of being generally abusive of journalists. For instance, he struck out at against FOX moderator Megyn Kelly, who hit the Republican with critical questions during the first televised debate. After the program, Trump suggested that it was Kelly’s "time of the month," suggesting that this was why she treated him so critically. So far, however, neither Trump's many easily detectable lies nor his conspicuous behavior seem to have left any impression on voters. The conventional rules for candidates, under which several such missteps cause poll ratings to plummet, seem not to apply to Trump. Whether mocking a Vietnam veteran like John McCain or spouting sexist talk, nothing seems to sink his poll numbers. Therefore, it is unlikely there will be any consequences for aping the disabled Kovaleski. More than anything, it is contempt for the elite and the media that drives a majority of Trump supporters. The same type of enraged German citizen who cries "lying press" - in the U.S. hoots with delight at Trump's political improprieties. After each of Trump's outbursts the mainstream media wonders when, at last, the red line will have been crossed. Now though, a growing number of disillusioned analysts are concluding that in the United States, there may no longer be any red lines. Milenio, Mexico: Donald Trump: A Rare Unifying Force for Mexicans and Gringos!